Kann ich im Gegenzug etwas für dich machen? that is true! 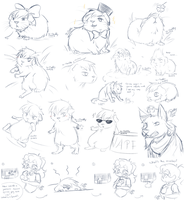 I drew guinea pigs from time to time because they are so cute! I have 3. I had 5 myself till June thise year but then 2 of them died, one of them yesterday ._. im a llama trader! i too found you by clicking random deviant, and i love your icon! did you make it? if not, who made it for you? ..and thanks! Mahsira made it for me.